The map of the London Underground or Tube Map is world famous, however the story behind its creation has became almost as famous. In the early days of the London Underground, there was not a single organisation but rather a collection of independent railway companies that constructed lines in the late 19th and early 20th centuries. These companies only tended to publish route maps of their own services, the maps also used to feature stations and nearby places of interest or main streets or roads. The first combined map was produced in 1908 by the Underground Electric Railways Company of London (UERL) and four other companies Central London Railway, City and South London Railway , Great Northern and City Railway and the Metropolitan Railway. This was the first time the companies tried to adopt a common “Underground” brand. However it quickly became clear that the maps in the crowded central areas were not distinctive enough due to the tradition of including other geographically-based information. Many styles and formats were tried but none was that successful until 1920 when MacDonald Gill omitted the geographic background detail . In 1931, Harry Beck who was a London Underground employee considered that as the railway was underground, most travellers where only interested how to get from one station to another and were little interested about other information. Therefore Beck set about devising a simplified map, consisting of stations, straight line connecting them, and the River Thames; lines ran only vertically, horizontally, or on 45 degree diagonals. To make using the map easier and to emphasise connections, Beck differentiated between ordinary stations and interchange stations . 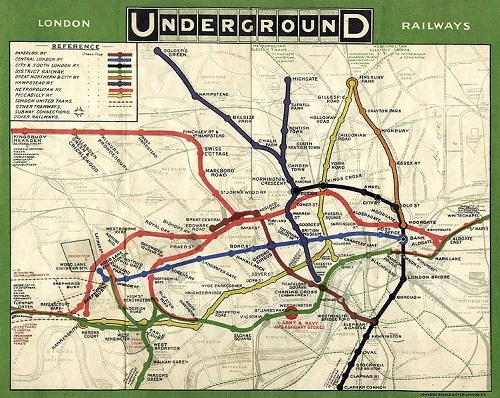 Beck had developed the map in his spare time and with little support from his employers, however in 1933 a small pamphlet was made based on Beck’s design and issued to the public who quickly adapted it as the “Tube” map. Despite the time and effort taken in making the map, Beck was only paid ten guineas for the design and five guineas for a poster. However Beck continued to design the map until the 1960s. Other designs have been tried but have been rejected by the public who have been remarkably loyal to Beck’s design even though the distances on the map are not geographically correct. In the last few years, Beck’s map has been considered a design classic and other designers have played around with the map to produce their own artwork. Beck’ s importance was finally recognised by London Underground who issue the statement, ‘This diagram is an evolution of the original design conceived in 1931 by Harry Beck’ is printed on every London Underground map. Since the 1960s, changes have been made to the map to accommodate new stations and fare zones but tend to stay true to the design principles of Harry Beck. 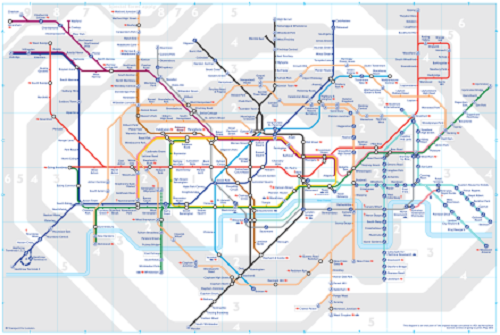 It was not only in London that the brilliance of Beck’s design was recognised, all around the world the basic concepts of the map were adopted for network maps. Even the font for the map which is known as Johnston has become the historic and generic font for all TfL uses, from tube station facades to London bus destination blinds.